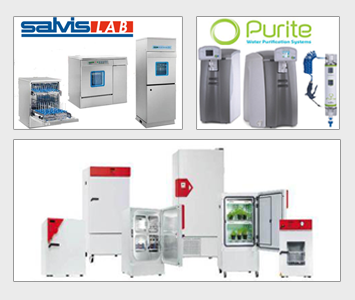 Innovative steam boilers – safe and energy-efficient We invite you to benefit from the CERTUSS rapid and highly efficient steam generators built according to the tried-and-tested water tube boiler principle. The output level depends on your individual requirements: Single steam generators with steam outputs from 8 - 1,800 kg/h or multiple steam boiler plants up to 10,000 kg/h. Rapid steam generators: Fastest steam availability through shortest heating-up phases. Combustion a la carte: Gas, oil and combination combustion or electrically-heated steam boilers. Space-saving: Thanks to the vertical design of our steam generators. Maximum operational safety and energy efficiency: Through the water tube boiler principle. Your savings potential: Reduced energy requirement through flexible output adjustment. 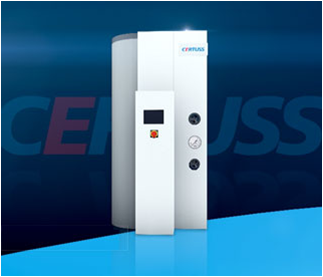 The energy efficiency of the steam generators from CERTUSS is already visible in the heating-up phase. Full steam output is reached within a maximum of 5 minutes after a cold start. An extremely high degree of efficiency of up to 98 percent at simultaneous usage of an Economiser is achieved through the patented 3-fold combustion air preheating. At almost all applications the steam requirement fluctuates during the course of operation. The pressure system of the steam generators from CERTUSS respond to this. Thanks to the design as a forced flow boiler as well as the electronic combustion management and the pilot burner system, the output is adjusted immediately to the respective application. The modulating output adjustment of CERTUSS makes steam available in peak load times just as reliably as during phases with lower steam requirements. In the rapid steam generator small water quantities are heated up energy-efficiently. Thanks to the design as water tube boiler the heating up phase is very short. Emission losses from the coil tube are lower than in ordinary water chamber boilers. In them larger volumes have to be heated up that furthermore lose more energy through the water surface. The patented air insulation with heat recycling and preheated combustion air differs from all the other systems and designs. Clean combustion air is drawn in from above. This air counteracts the trapped heat from the combustion chamber. Thanks to the combustion air preheating, a combustion-specific degree of efficiency that is unusually high for steam generators is achieved. The burner cuts in earlier. The air circulates through a 3-chamber system consisting of a main combustion chamber, inner insulation and outer insulation. Emission losses are minimized through the 3-fold air insulation. Additional recycling of heat is achieved through the steam dryer of the CERTUSS supply unit CVE. The highest degree of efficiency is achieved through the additional heat recycling of the flue gas. The gas, oil or combination combustion steam generators from CERTUSS are equipped with high-performance Economisers. Resulting in a degree of efficiency of up to 98 percent. The optional Thermotimat-control unit from CERTUSS allows fully automatic operation free of supervision for 72 hours. At the TC series remote controlling via a central control system / building services control system or an external pulse is also just as possible as the display and transfer of operating and fault messages via Ethernet, CAN bus or PROFIBUS, as well as remote programming via a GSM modem. Is the available space in your boiler house limited or do you want to use the installation surfaces more efficiently? Then the compact CERTUSS steam generators are the solution. Thanks to the special design space-saving and safe installation in working areas is possible. A separate boiler house with long pipelines from the steam boiler to the consumer is no longer required. Whereas boilers of other designs (water chamber boilers) require a foundation or pedestal, no foundation is necessary for CERTUSS steam generators. The vertical design is based on physical knowledge and in addition to the reduced space offers the advantage of easy access for maintenance. This can usually be carried out by the owner-operators themselves under reduced costs. The boilers are not a potential hazard in the working area because, in contrast to water chamber boilers with their large water volumes, only a small amount of water is heated up in the coiled tube of the CERTUSS steam generators. 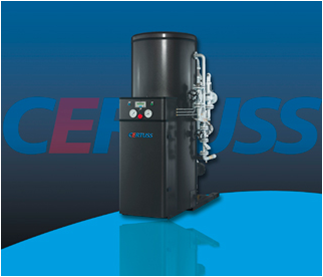 CERTUSS steam generators do not become hot thanks to their insulating air chambers. Additional insulation is not required. Quiet operation thanks to noise insulation: Suction noises, as is normally in the case at burners, have been eliminated at CERTUSS steam generators through the type of air routing. Vibrations are avoided through elastic fastening of the aggregate. In accordance with the European Pressure Equipment Directive 97/23 EC the CERTUSS steam generators are classified as Category I, II or III depending on the operating overpressure. 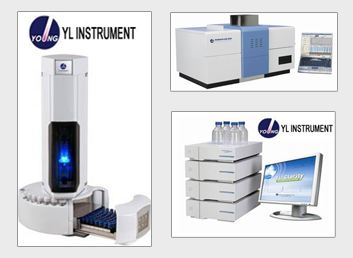 They have been tested in accordance with the EC type examination. Installation and operation of boilers with a steam output up to 850 kg/h do not require a permit in Germany. The initial commission is carried out by the experienced technical CERTUSS customer service. The steam generators are adjusted optimally to the operating conditions and the operating personnel is instructed thoroughly. The technical values are documented for future verifications – also for official authorities, for example the flue gas engineer/chimney sweep. This also includes the clear marking of the correct measuring points. Have your offer drawn up for the commissioning process. The electrical steam generators E 6 M - E 72 M from CERTUSS offer you impressive output in 14 different output sizes. They are compact, economical and have a high output. All electrical versions do not require a permit for installation and use in Germany. The electrical steam generators E 100 from CERTUSS offer you impressive output in two output capacities of 100 - 120 kW heat output. They are compact, economical and have a high output. All electrical versions do not require a permit for installation and use in Germany. The small steam boilers of the Junior 80 - 400 TC series are completely equipped, ready-to-operate, electronically controlled rapid steam generators with all safety devices for burner technology, pressure and temperature. With a height of only 1.5 m and 0.7 m width the Junior 80 TC steam boiler can be erected even in small spaces. The new generation of a proven series. The CERTUSS Universal 500 - 1800 TC steam generators are characterized by the immediate modulating output adjustment and the simplified operation. TC is the abbreviation for Touch Control. CERTUSS steam generators of the Universal series with oil, natural-gas or combination combustion are manufactured in four sizes. Individually or combined they meet all requirements and dispose of lightened official installation conditions in Germany. CERTUSS steam generators of the Universal SC series with oil, gas or combination combustion are manufactured in three sizes. Individually or combined they meet all requirements and dispose of lightened official installation conditions in Germany. 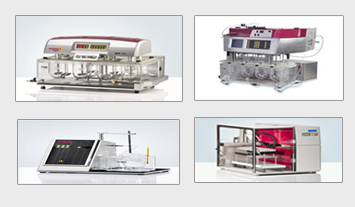 The SC series provides you with a simple overview of the operating states through the installed CERTOMAT system. 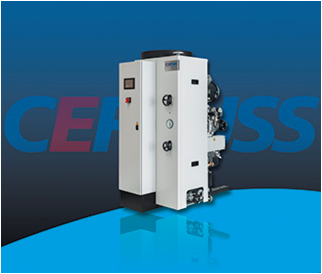 Our steam generators are available on request as a ready-to-operate steam boiler plant: CERTUSS steam generator plus CERTUSS supply unit CVE. All components for the water supply and water conditioning of the CERTUSS steam generator are included in the complete steam plant. The flexible application options for a multiple steam boiler plant ensure greatest efficiency at maximum energy savings. Steam generator including CERTUSS supply unit (CVE) as a ready-to-operate boiler house installation, protected against corrosion on a powder-coated basic frame. The individual elements are laid out to save space and are optimally attuned to each other. Professional installation of all the water, steam, electrical and energy connections in the factory ensures reliable and safe operation of the steam boiler plant. Complete piping from the steam generator to the CERTUSS supply unit CVE including insulation of the feed water tank. The ready-to-use water supply with the CERTUSS supply unit saves time and money through considerable reduction of the mounting work. The CVE supply unit is compatible with all the CERTUSS steam generators. In addition to the CERTUSS supply unit as a ready-to-operate boiler house installation on a basic frame, we also offer a complete container installation on request. Depending on the desired steam output a multiple steam boiler plant may be suitable for you. 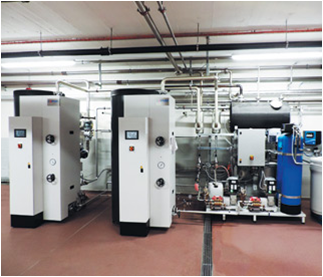 A multiple steam boiler plant from CERTUSS consists of several steam boilers connected in series plus the CVE supply unit. 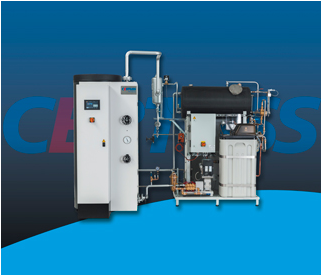 With a multiple steam boiler plant from CERTUSS you profit from a highly flexible steam supply through cascading. 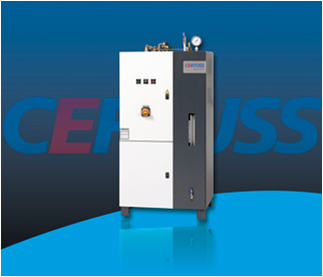 The CERTUSS steam generators interconnected in a steam system act respectively as the lead boiler for the base load or as the standby boiler for peak load periods. High steam requirements are covered with a multiple steam boiler plant. Whether 2, 3, 4 or more combined boilers depends completely on your requirements for the steam supply. The displays are effected on the touch screen of a selected steam generator. They can be called up at allocated workstations with all the operating functions. Variable distribution of the steam supply to base load boilers and to peak load boilers For example, at a 3-fold plant two steam generators take on the base load. A third one cuts in automatically in the case of peak loads. Thanks to the cascading, the steam system adapts rapidly to the respective requirements..
Consequent cut-in of a steam generator that is in standby mode for example during maintenance of an active steam generator. The cut-in boiler acts as the redundancy boiler (reserve boiler). Even load distribution ensures an even distribution of the operating hours per boiler. CERTUSS steam generators can be combined amongst each other, meaning that, for example, boilers of different years of manufacture and sizes can be interconnected and combined with each other. Notable reduction in fuel consumption through automatic changeover between lead boilers and standby boilers. A 4-fold plant with 4 Universal 1000 TC steam generators allows, for example, a maximum steam output of 4,000 kg/h. Whether during periods with full steam output or during phases with less required steam – the flexible output adjustment ensures that the maximum savings in energy is achieved.